Who remembers that 80’s tv show Home Improvement with Tim “the tool man” Taylor? It’s a show that I remember fondly from my childhood. Tim was always getting in over his head with a project and then it would magically resolve itself before the 30 minutes were up. Amazing! I wish real home improvement projects would magically resolve themselves in 30 minutes or less, but real life is not the least bit like sitcom tv. Like most women, I usually rely on my hubby to do the heavy lifting when it comes to home repairs or improvement. I feel bad that this is a job that gets put on the guys in our lives. But, that just seems to be the way it is. The Nailed It stamp set is the perfect way to thank the guys in your life that do the heavy lifting for you. 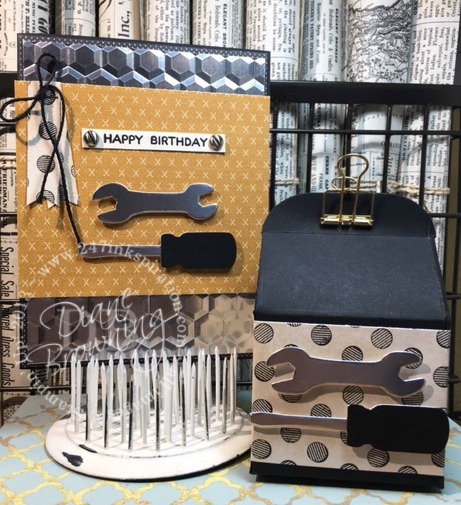 The stamp set comes with a bunch of different tools and sentiments. Plus we have a coordinating set of dies to go with it. 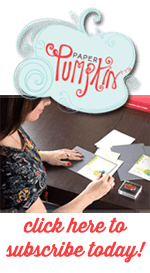 So how about a sample using the new Nailed It stamp set? I paired the new stamp set with some of the supplies from the new Urban Underground Product Suite. 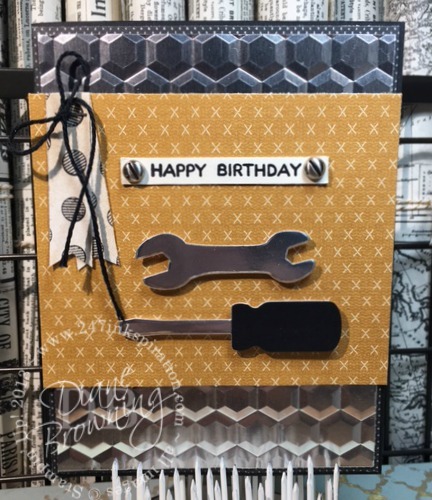 The Hexagons Dynamic Embossing folder and the Urban Underground Paper and Embellishments coordinate beautifully with the tools from the stamp set. I used our Silver Foil paper in the Embossing folder and it looks like a sheet of metal. I used the Silver Foil Paper for the tools too. I’m amazed at how realistic the self-adhesive screw heads look. 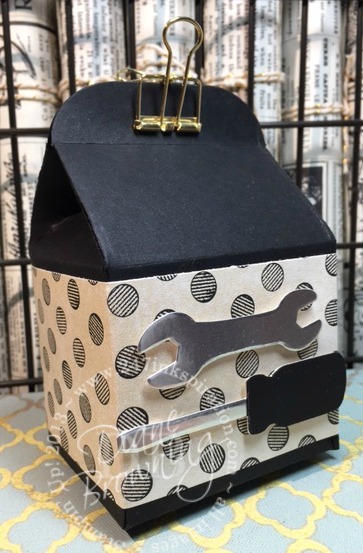 If you’re giving your handy man a card, you’ll need a matching box that you can put that home repair store’s gift card in. Or maybe you’ll just wrap up that honey-do list and remind him how much money he’s saving by not hiring a professional so it’s just like giving him the money as a gift. Now I can’t leave you thinking that it’s always me cracking the whip to get the work done. Okay, yes it usually is me because my hubby and I have different definitions of “soon” when it comes to finishing projects. But, I’m not afraid to jump in there and help out. I can install kitchen cabinets and flooring with the best of them. And if the day job doesn’t work out, I might have a future in drywall patching.